While other packaging materials may offer some of the beneficial characteristics of aluminum, they can’t provide the full range of benefits of aluminum can packaging. Aluminum enables designers, engineers and manufacturers to take full advantage of a wide array of physical characteristics. It weighs less by volume than most other metals. And, aluminum is easier to handle and less expensive to ship. 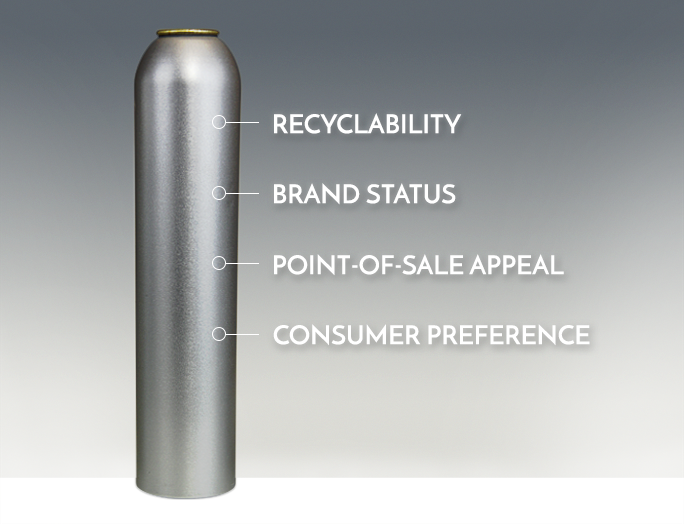 From aerosol cans to bottles to other types of Al packaging, Aluminum also offers an unmatched combination of high strength, lighter weight and corrosion resistance. Aluminum is also unsurpassed in shaping and decorating possibilities with exclusive shapes and formats that create added value and bring distinction to brands and their products. Aluminum is a unique metal: strong, durable, flexible, impermeable, lightweight, corrosion-resistant and 100% recyclable. In fact, aluminum is at the top of the recycling chain because of its infinite recyclability without any degradation in its quality. That’s why more than two-thirds of all the aluminum ever produced remains in use today.Since recycled aluminum is considerably less expensive than aluminum produced from virgin ore, many manufacturers are eager to specify it for use in their products. Recycled aluminum can take many forms, allowing its use for a wide range of products. The proof is all around. Aluminum saves more energy during recycling than any other material. Recycling aluminum requires only 5% of the energy when compared with the production of native aluminum from bauxite ore. Aluminum may be recycled and reused again and again at a fraction of the initial production costs without losing any of its characteristics or quality. Recycling of aluminum uses less energy and can offer substantial costs benefits, which appeals to manufactures, end users and environmental groups. Aluminum has inherently up-market qualities that distinguish it from other packaging materials. Its unique physical properties provide the means to launch new brands, introduce existing brands into new markets, and re-energize mature brands to new levels of success. In every instance aluminum packaging offers the looks and style to elevate products and brands far beyond the competition. Packaging that creates attention and differentiates at the point-of-sale is vital in winning the battle to be the brand of choice with today’s shoppers. CCL Container’s aluminum packaging offers exceptional shaping and stunning decorating solutions that bring premium brands to life on store shelves and have consumers taking them home. Aluminum packaging has long been, and continues to be the container of choice for consumers who respond to innovative form and reliable functionality. The superior look and feel of aluminum creates an impression of upscale quality that is unmatched by other packaging materials. Increasingly, premium brands are adopting aluminum container solutions with unique shapes and eye-popping graphics that grab consumers’ attention. Superior recycling qualities are another reason why the ever-growing world of environmentally conscious consumers favor products packaged in aluminum.